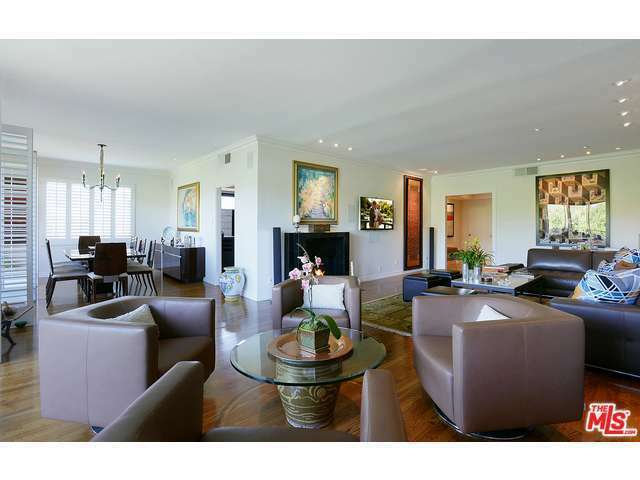 This beautifully remodeled top floor unit is 2500 sf and offers unobstructed verdant treetop views. Light drenched with Eastern and Southern exposures, it features hardwood floors, fireplace, recessed low voltage art lighting as well as wiring for sound throughout. A gracious entry foyer opens to an expansive L shaped living and dining area with walls of glass to the view and a deck with cement pavers, potted succulent plants and a BBQ. The chef's kitchen features a center island with prep sink, top of the line stainless steel appliances, granite counter tops and beautiful glass tile backsplashes. The extraordinary master suite is huge with a sitting area, 2 enormous walk in closets and a marble bath with spa tub and large shower. There is also a cozy den area with built in shelving, in unit laundry, 2 side by side parking spaces and an additional storage closet. This is a rare offering in this ideally located 12 unit building with pool and EQ insurance.